What would be the best pit/warmer for cooking all types of foods and trying to keep all cooking on the back porch. I know everything has drawbacks no matter what. I am building a 30ft overall traile that will have a 12ft bbq porch. That porch will have a pitmaker vertical with 5 racks so a lot of butts. I need tons of grill space for my hobby which is jerky. My current smoker has about 19 sq ft but I need about 4 times that minimum. I have debated making hanging rods for the jerky but I'm building a big smoker none the less. I thinking a sizable offset. Haven't decided on direct, tuning plates, reverse, or hybrid. I envision at least 3 opening doors on the main chamber with 3 racks each maybe 4. 23x25 inches per rack. Then have a warmer atop the firebox that can also utilize the smoke when open. I have debated a griddle built into the firebox top. If I did that I would still add a regular charcoal grill for quick burgers and dogs. So what do you recommend for cooking everything outside and only refrigeration and prep inside for the most part. This will be a lunch and dinner spot eventually and maybe keep just 1 cooker going all the time or maybe just the charcoal grill. Thanks, I'm foreign located and health dept is pretty relaxed. I would only forsee the 500 at a race track where we get about 2k to 5k people at the events. Thats only about 5 times a year. From watching current venders the line just doesnt seem to go away for about 6 hours. I hopefully would have mostly pre-made foods except for quick grill stuff. Developing a team will be a priority for me. Im hoping for 3 to 4 people at a time working. Maybe 2 shifts or close to it. Order person who does the drink and cash, prep person plating sides and chef cooking, then a floater replenishing and maybe plating cooked foods from porch. I really have no idea. I'm new to this. I'll try to look up your mentioned smoker. I'm glad your health department pretty relaxed because some states are a nightmare. I do all my cooking outside at this point. HAD a grill on the porch across from Lang 84 deluxe RF, but the heat between the two was unbearable!! I recently added a moisture controlled warming oven to my porch - can cook a day in advance and hold butts and briskets and not even the most picky can tell the difference!! 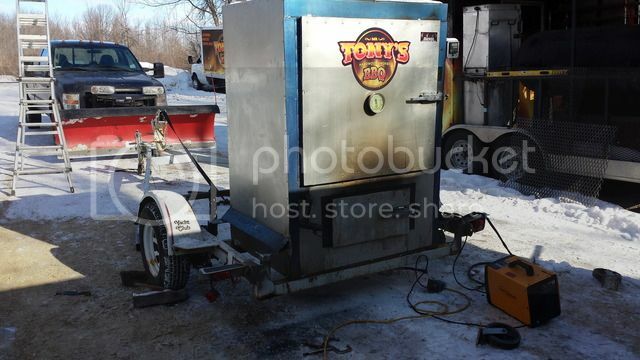 My next rig will have deep fryers and a flat top for some special events etc. but I have survived 5 years with this trailer serving over 1000 / day at big gigs. Feel free top comment here or pm if there are specifics you care to ask!! I got where I am thanks to fellow Ringers - glad to help where I can!! I picked up one of these to go on my next build. Will fit across the back of a porch trailer, 22sq' between the 3 racks, plus warming cabinet. What's your opinion on pitmaker Vaults? Have you ever burned charcoal? That's what I currently have. It's a vertical 5 rack. 20 sq ft I believe. Charcoal fired and add wood chunks is what I've been doing. A 40 lb bag of charcoal last a few burns pretty easy but 1/2 of what I do now is short 4 to 6 hr cooks. Wood supply for me is an issue. The best smoking wood I've found so far is NANCE. I'd say it's closest to alder compared to the states side woods. I've been buying up all the hickory I see in bags. I'm also buying all the lump charcoal I can. They occasionally have cowboy mesquite and sometimes the regular that doesn't specify. I'm working on wood sources and considering converting to gas assist or pellet eventually. I have a very large capacity Water / RF cabinet smoker that holds up to 700 pounds. It does a nice job with lump and splits mixed! I must say I prefer my RF's for flavor, but prefer the guru type system on the cabinet smoker for sleep!!! Very few of my customers can tell the difference - none complain about the subtleties!